The Coopered Tot: Glen Grant Five Decades: A Mature Beauty With a Baby's Face. A Deceptively Simple Malt With Hidden Depths. Glen Grant Five Decades: A Mature Beauty With a Baby's Face. A Deceptively Simple Malt With Hidden Depths. 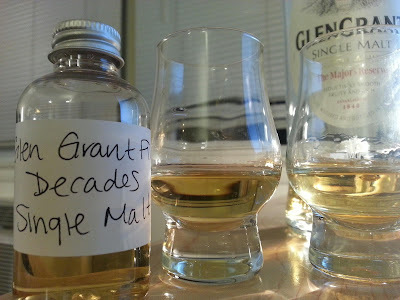 Glen Grant Five Decades is a deceptive dram. A visual twin for the entry expression it also shares a similar nose. But that's not the full story. A limited edition Glen Grant is about to be distributed in the USA (September, 2013). It is a special vatting of selections from the 1960s, 70s, 80s, 90s, and 2000s, by Master Distiller Dennis Malcolm. This occasion of this special blend is the anniversary of Malcolm's five decades with the distillery since he began as an apprentice cooper in the early 1960s. It's meant to be a statement expression and is priced accordingly. MSRP in the USA is $250 for 750ml. I'm a big fan of Glen Grant. The Major's Reserve is a solid low cost single malt. Recently, I've been plumbing the depths with an amazing sherried 12 from the 80s, and more complex refill sherry 16 and 37 year old single cask expressions all from independent bottlers (reviews to follow). Glen Grant achieves classic Speyside white pear and honey flavors that take brilliantly to sherry and to aging. Hyper mature Glen Grants are floral fruit baskets that just hit my monkey bone. I was very excited to try this interesting blend of mature and young whiskies. Glen Grant Five Decades 46% abv. Color: Pale gold - straw. Nose: Gently floral magnolia, heather and honey with fresh breezes of linen. Deeper nosing reveals a bit of musky waxy ambergris way underneath. It's lovely but rather shy nose. Palate: Sweet and lightly malty on opening. There is vanilla, and florals, and treacle sugar and bit of honeycomb - but very light. There is some white pear and melon too. The expansion is gentle and brings an underlying structure of fresh malt, barley cakes, and white tea. The finish is warming and gently malty, with some hints of oak and seed cake, but also of cardboard. It's overwhelming light and feels more of immature malt than mature malt. Adding two drops of water makes the nose even more shy - but amps up the sweetness and richness of the palate. The entry fairly explodes with juicy treacle sugars. The floral, vanilla, honey, and lightly waxy aspects are enriched and it becomes quite a tasty dram. But it still feels quite a bit on the light and young end of the spectrum. With some extended air things open even further. I begin to get sherry notes: jammy fig cake, leather, olorosso woven into the honey and grass sugars. This is delicious - but this extreme degree of evolution is, frankly, a little weird. 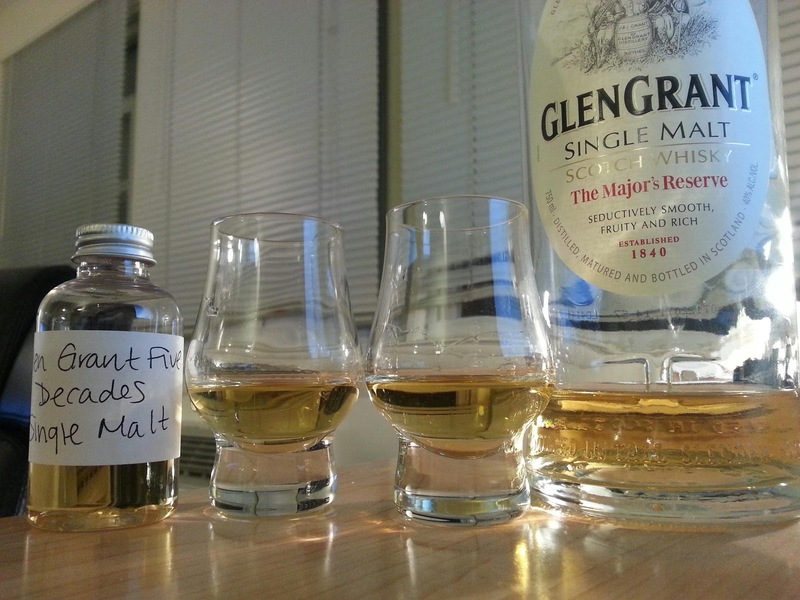 In my initial tasting the color and light balance on the palate and, in particular, the nose made me grab my bottle of Glen Grant The Major's Reserve (a whisky that goes for about 1/8th the price of Five Decades). Initially I was finding a lot of similarities: youth, honey, treacle sugars. But with two drops and water and more time to open the Five Decades, despite looking identical in the glass, achieved a dramatically richer, denser, and more complex palate. The nose, however, remains strikingly similar. My initial impression was 'this is way too light and young to be worth this price'. However, time and water take Five Decades to someplace special. It's not like the rich, mature, Glen Grants - and it's not like the young sprightly Glen Grants. And it's not like what you'd expect a straight mixture would be either. The result of Dennis Malcolm's efforts is a decepticon that comes off as young and simple when first poured - all the way from the light color to the gentle nose and the light creamy flavor balance. But time, air, and a few drops of water unleash depths of richness and complexity that take their time to show up. Then Olorosso sherry flavors and big sugars and honey floral aspects enliven the palate - but not the nose. I found this coy fan dance delightful - like a color change gem. But I won't be surprised if some folks are disappointed - particularly if they jump to conclusions. Light and nimble isn't normally what people want from their expensive limited edition drams. It's confusing, but ultimately beguiling.